He has been a frequent choral conductor and clinician at festivals and workshops throughout Japan, Korea, Guam, Italy and Germany. In 2009, he founded the ‘South African Music Technology Project’ (SAMTP) and guest-lectured at the University of Pretoria, South Africa. Mr. Black received his Bachelor of Arts in Music Education from Whitworth College in Spokane, Washington. He received his Master of Music Degree from the University of Missouri-Kansas City’s Conservatory of Music, while studying with Dr. Eph Ehly, and sang with the Kansas City Chorale under conductor, Charles Bruffy. He is currently a Doctoral Candidate in Music Education at Boston University. 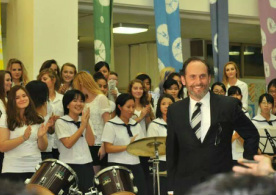 His forthcoming Dissertation entitled, “Toward an Understanding of Intercultural Collaborations through Activities in Music Education within a Large Overseas American Schools” is a narrative inquiry into the practice of musical interactions between overseas host-nations and American music student and their teachers living abroad. It will be published in early, 2015. Currently, Mr. Black sings in the Bellingham Chamber Choir with Ryan Smit and, in November, 2014 will be the guest choral conductor for the San Juan Music Educators Association’s Senior Honor Music Festival. He resides in Bellingham, Washington with his wife Amy. Their three grown, musical children, Josh, Benjamin and Mikayla as well as their two grand-daughters, Anzoleta and Alexandria also live in the Bellingham-area.